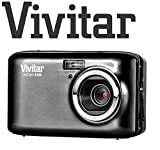 With its great design and range of great features, the great value Vivitar ViviCam E128 Camera is as practical as it is stylish. It’s slim enough to fit easily into your bag or pocket, while also boasting an impressive 18-megapixel resolution and 4 x digital zoom. You can shoot HD video on this camera too, while the 2.7-inch screen is perfect for framing and reviewing all your video and images. This entry was posted in Discount Photography and tagged 18MP, Camera, Compact, Digital, E128, MegaPixel, Vivitar by Ball Photo. Bookmark the permalink.